Oiwi - meaning Native Son is our first boat. 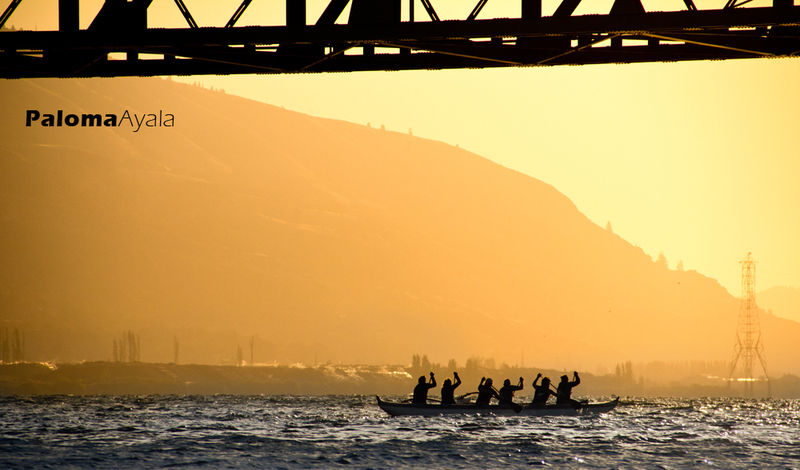 Oiwi, a Hawaiian class racing canoe bought in 2012 is the reason that HROCC was formed in 2013, thanks to an intrepid band of founders. She came to us from the Bend Outrigger Canoe Club. She handles the wind & waves with grace and strength and is much loved and used. She weighs in at 419#. Race boat #91. Manu oh 'ke Kaha'wai - meaning River Bird or Bird of the River is our third boat. She is a Malia and came to us from Ashland as part of the purchase for Haku Nalu. She spent a winter up in Parkdale as restoration began. More work was done on her throughout the 2016 season. Many hands contribute to the day to day maintenance of all our boats but a particular thank you goes out to Josh, Tony Fitzpatrick, Bob Smith. John Everitt, Bill Babcock and John Ritter. Manu Kaha'wai was launched in early 2017 bringing our fleet to 3 boats. She is a smooth & fast boat in the water and crews paddling all 3 boats often race side by side. Here is a link to learn more about the Malia canoes: Malia History. Our Mailia weighs in at approx 450#. Manu is a great training boat but doesn't currently race. Kuakea - meaning White Cap is our Puakea Malolo Unlimited canoe. After a club-wide fundraising initiative in late winter/spring 2017 we were able to purchase her and she joined our fleet in May 2017 bringing the total number of canoes we paddle regularly to 4. Kuakea raced in 2017 and our crews did well! Kuakea LOVES the downwind runs on the Columbia! She weighs in at 145#. Race boat #93.